Robert Langer is an Institute Professor at MIT (there are 13 Institute Professors at MIT; being an Institute Professor is the highest honor that can be awarded to a faculty member).Over 300 of his trainees are now professors, 13 have been elected to the National Academy of Engineering and 9 have been elected to the National Academy of Medicine, and 34 to the Technology Review 35. His h-index of 222 is the highest of any engineer in history and he has over 1,100 issued and pending patents worldwide. His patents have licensed or sublicensed to over 300 companies. He served as Chairman of the FDA’s SCIENCE BOARD (it’s highest advisory board) from 1999-2002. 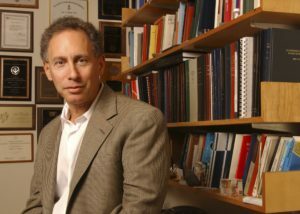 Langer is also one of very few individuals ever elected to the National Academy of Medicine, the National Academy of Engineering, the National Academy of Sciences and the National Academy of Inventors. He is one of four living individuals to have received both the United States National Medal of Science and the United States National Medal of Technology and Innovation. In 2015, Dr. Langer received the Queen Elizabeth Prize for Engineering, the world’s largest engineering prize. He has also received the Charles Stark Draper Prize (sometimes referred to as the engineering Nobel Prize), the Albany Medical Center Prize, the Wolf Prize for Chemistry, the Millennium Technology Prize, the Priestley Medal (highest award of the American Chemical Society), the Gairdner Prize, the Kyoto Prize, the Breakthrough Prize in Life Sciences and the Lemelson-MIT Prize, for being “one of history’s most prolific inventors in medicine.” He holds 27 honorary doctorates including honorary degrees from Harvard and Yale.